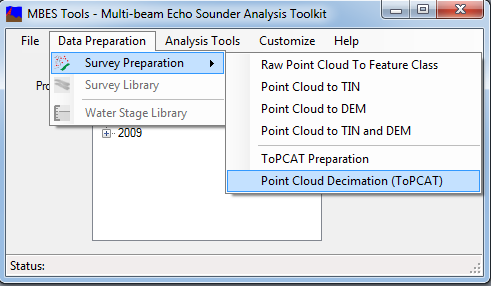 ToPCAT point cloud decimation tool takes in a space delimited x y z file, x and y sample window resolutions, and a minimum number of points to calculate a statistics. By gridding the points based on the user defined x and y resolutions it calculates valuable statistics for each sample window with at least the user input.minimum number of points. These statistics are stored in a single point in the center of each sample window. 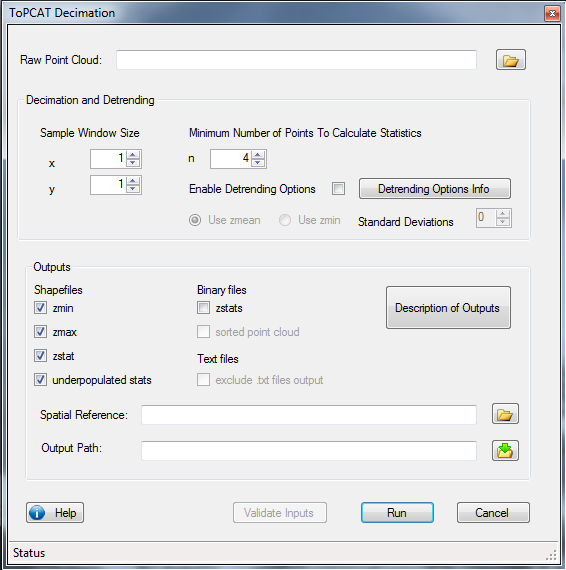 Point shapefile containing the statistics calculated for each sample window. The representative point is in the center of the sample window. Point shapefile containing the x,y location and z-value of the minimum value in the sample windows. Point Shapefile containing the x,y location and z-value of the maximum value in the sample windows. Point shapefile with points at the cell centers of sample windows that did not have enough points to calculate all of the statistics calculated for its sample window. Still contains some statistics it was able to calculate.